They rarely hint at exactly what we all should expect to have “known” on that date. Our guess is this online phenomena may have been part of a concerted effort to advertise the beginning of a new door-to-door witnessing effort by local congregations to promote their corporate website and to change their public face. This new campaign began on August 1, 2014 in the United States and continued at least through the first weekend of that month. Jehovah’s Witness publishers showed up en masse in neighborhoods and on street corners distributing a tiny 4-page flyer, “Where Can We Find Answers to Life’s Big Questions.” Their current answer seems to be the new version of their website, JW.org. The Governing Body of Jehovah’s Witnesses, or whoever runs the marketing company trying to rebrand Jehovah’s Witnesses and the Watchtower Society, apparently underestimates the intelligence of those who make up “the world.” Their attempt to rebrand the Watchtower organization may fool some unsuspecting and unaware people. However, the track record of Watchtower abuses is long and their accountability will not be dismissed by simply implementing a new marketing approach. The Watchtower’s policies and practices have not changed. Their silence and continuing cover up of abuse has not changed. The only thing we can see is that they have changed their presentation and that their use of a slick new marketing campaign is now underway. As Jehovah’s Witnesses move into the next stage of their “International Conventions” outside of the USA, the Watchtower’s founding country, the secular press and local politicians should note that the UK’s Charity Commission is currently undertaking a statutory inquiry into The Watchtower Bible and Tract Society. There are just too many issues being raised about the growing number of child molestation within the organization for them to ignore the problems any longer. In Finland, Watchtower representatives have been publicly embarrassed recently. The Minister of Justice made it clear to them that they “must comply with the law.” The national law he is referring to specifically applies to the activities connected with their use of private “Judicial Committees.” Those “Committees” may be in violation of the law by handing down punishments to individuals outside of the mainstream court system. “The world will not be fooled by this devious marketing exercise. The ‘world’ still needs to know even more about Jehovah’s Witnesses and their beliefs and hurtful practices. “Abuse survivors are still waiting for a public apology and a change in the policies that protect pedophiles, allow coverups and put at risk women and children. “A rebrand is to be expected from a publishing corporation. A rebrand does not wipeout accountability for the countless lives damaged by Jehovah’s Witnesses practices. 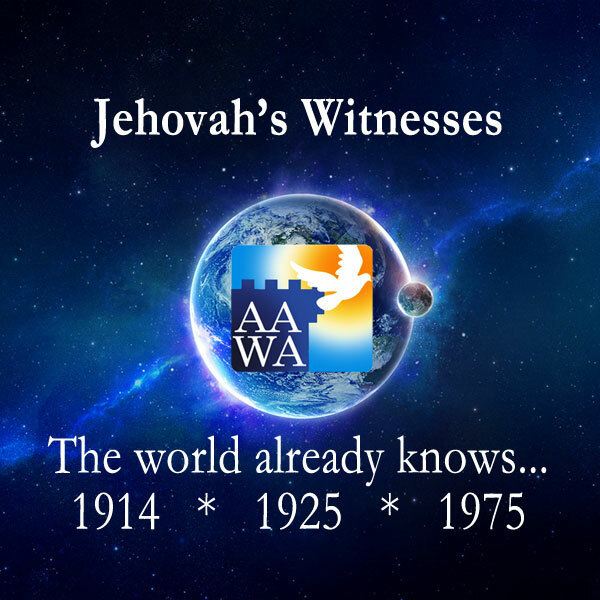 AAWA will continue to highlight the abuses that are the responsibility of the Governing Body of Jehovah’s Witnesses. That won’t change as the Watchtower tries to hide their dangerous and abusive policies behind whatever “new public image” or fancy logo they create to promote their organization. The Governing Body will be judged by their deeds, not by their marketing. So the Watchtower is on the MOVE-may they move to help the “faithful” to wake up and realize that they have been suffering and making family members suffer Not to Serve God but the god Watchtower and organization. May light and life shine upon the abused and abusers. It is a website supported by people who are not locked into worshipping a marketing corporation. Glad you popped by and look forward to you freeing yourself soon. So glad I found this site! I have been alienated by my family for so long. It is comforting to k know that I am not alone. Can you provide me with that information or link to those funds? I will be very interested to see & share the info..
Hello Jerry! I like to read the information provided here. I walked away from the jws because of the gossip and psychological abuse gangrene. With all due respect, let me tell you as a person who grew up in Chile;your coment is a little ill inform and I can’t stand when people try to slander others without knowing all the facts. In Chile, by law, EVERY citizen or entity must display the flag during the indepence celebration period (sept 17-20). This means is required by law. Citizens are subject to recieve civil infractions if the Chilean flag is not properly displayed during those days. Jehovah’s witnesses in the country are encouraged to follow and obey the law. That is the reason why the chilean flag is displayed at the homes of Jehovah’s Witnesses and the Kingdom Halls. Hi Patty, please enlighten me! In what way am I ill informed? Are you saying that the Chilean flag was not displayed in two kingdom halls? I do not care why the flag was displayed. The fact that it was displayed is good enough for me. Perhaps you deny the Candice Conti scandal also? Or maybe you deny the Mexico Malawi scandal! Please refrain from accusing me of being ill informed! I know that this cult is a barbaric and sinister edifice. You say you left the cult? This is debatable. You may have made a “great escape” but your post shows that you never got away. That is not an “obelisk”. You better look up the word. Photo of the Earth, yes, obelisk, um, no. pax – thank you for bringing that error to our attention. You are absolutely correct, the image is more similar to a “monolith” (as used in the movie “2001”). I have changed the word to correct the statement. Good catch! Yes this makes perfect sense.. In light of many abuse cases that WT has silently settled over the past several years, and doubtless many more to come out.. they need to ramp up membership (and the donations that come along with those new members) in order to keep that nice cash flow. The fall of the organization is inevitable.”The Tower” card of the Tarot deck by Rider-Waite is my dream come true. Hi Joel, hope you’ll allow me a better-late-than-never comment here as I only just saw this post today. The fall of the organisation would be stunning that’s for sure; for myself however, I feel it most unlikely. I often ponder Jesus’ words about ‘wheat & weeds’ and how truth and error can co-exist side by side, seemingly without disturbance from outside influences, even until the end of time according to Jesus’ thoughts. Wish I could share your optimism about the fall of the empire, but experience seems to indicate otherwise. Perhaps a government withdrawal of tax-exempt status could trigger seismic reactions in the org…I live in hope of that ! Best wishes. if THE JWs fly the flag at the KH in Chile that is a direct hypocritical thing they are doing and against what they claim to teach. The JW’s do not even salute a flag of any country and would be DF’s if they did according to what they claim. Also, if they allow their member s to be killed in that past for not getting a ID political card and won’t even stand up at Sport events when the national flag or song is sung how could they allow a flag to be flown at their KH in any country? If they are true to their own teachings they should say NO and pay the fine. Look how they secretly joined the UN and had to sign a pledge supporting the “IDEALS” of the UN and then claimed it was only to use their library research department. If that was true why did they abruptly resign from the UN when it became public knowledge? They are full of hypocrisy and personally I don’t even think the GB believes their own teachings anymore. 1914,The faithful and discreet slave, Gog of Magog,The 2nd coming of Christ, Overlapping generation etc. Whole blood vs blood particles, They are full of “dead men’s bones”!